Since its inception Amaze has been parent-led, innovative in its approach and recognised locally and nationally as an example of good practice and excellence. More recently, our direct work with young people with a wide range of additional needs has begun to have a significant impact. Our charity turned 20 in 2017 and, as part of the celebrations, we produced this film highlighting our work with families of disabled children and young people in Brighton and Hove over two decades. Parents speak movingly of the huge impact our services and support have had on their lives. You can read more parent’s stories on the impact we’ve had on their lives. We have grown significantly since 1997: our staff team has quadrupled, we have accumulated a wealth of experience managing numerous short and long term projects, our income has increased four fold and our core services are well established and secure. Each year we produce a report that summarises the impact we have had on the lives of families with disabled children and young people. See our latest Impact Report below. I’ve just read the Amaze newsletter. Can you pass on to colleagues that I really think you folks do an amazing job, year after year producing this high quality product that is incredibly helpful to people. I’ve seen it for many years now and am always stunned by the quality of it. April – Amaze launches Amazing Futures project providing peer support to young people with additional needs in Brighton and Hove. September – Amaze is awarded the PQASSO Quality Mark (at Level 2) by the National Council for Voluntary Organisations. The PQASSO Quality Mark is a nationally recognised award offering external checking and reassurance about the quality and credibility of small charitable organisations. 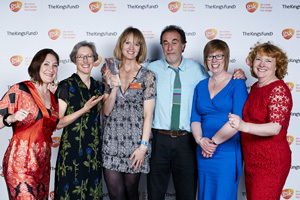 Amaze team celebrates winning their GSK Impact Award at London Science Museum ceremony. July – Amaze wins government contracts to provide ‘Independent Support’ to parents of children and young people with SEN and disabilities in both Brighton and Hove and West Sussex. (we subsequently won the contract to deliver this service in East Sussex from September 2016). This programme offers support to parent carers and/or young people who are going through the assessment and EHC planning process. March – Amaze named as one of ten GSK IMPACT* Award winners for 2014 from over 400 charities all over the country who applied for this flagship UK community investment programme. Amaze’s award was in recognition of the work it does to improve the health and wellbeing of parent carers and their families in Brighton and Hove. October 2012 – Amaze wins gold for ‘Biggest Impact’ in at the inaugural CVSF Sector Stars Awards. The awards, organised by the Community and Voluntary Sector Forum, recognised the charity’s work in Brighton and Hove with parents and carers of children and young people with special needs, some of the city’s most vulnerable families. 2011- The Compass is recognised as an example of good practice in Parent Participation in Contact a Family guide due to its independence and leisure card incentive. 2009 – The National Association for Parenting Practitioners commissioned Amaze Research and Training (ART) to deliver a series of workshops around the country, focusing on ‘Good Practice Working with Parents of Disabled Children’. 2008 –Together for Disabled Children identifies Amaze’s Compass database and leisure card as examples of good practice in engaging with parents and children. 2008 –Amaze was invited to consult with parents for the national Bercow Review into services for children and young people with speech, language and communication needs. Key recommendations in the final report reflected what parents said mattered most. December 2007 – Our website won Best Charity Site and a special accessibility award at the Brighton and Hove Web Awards. 2004 – Ofsted-SSI joint inspection, praised Amaze’s Parent Partnership work as ‘a model of excellence’. 2003 – Audit Commission cited The Compass as an example of good practice amongst local registers of disabled children. 2001 – Joseph Rowntree Foundation cited our newsletter and handbook for parents as models of good practice in ‘User-friendly information for families with disabled children: A guide to good practice’. Amaze offers such fabulous support and is a real asset to families in this area. We are all so lucky to have you.